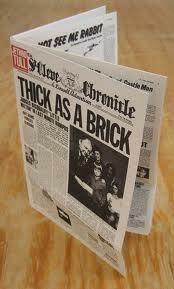 A very brief reaction to the just released sequel to “Thick As A Brick. If you are a Tull fanatic and buy their releases religiously then there is nothing here to break your habit of choice. It has some strong moments both lyrically and musically …..BUT.. As the original is one of thee albums of my youth it is doubtful anything short of a meisterwerk could placate this furrowed brow. Sadly, I know that meisterwerk and this is no meisterwerk. The original in its fake local newspaper cover made the release a joy even before placing the black plate of proggy folkiness on to the turntable of destiny. Dabs forehead, regains composure. The short snatches included from the original album only highlight the deficiencies of this reenactment. The power of the original song cycle is lost in this 17 track release. It seems Ian Anderson has said no for decades to those who have clamoured for this project. I think he should have stuck with his gut feeling on this one. If you treat it as a Tull release with no historic pretensions then I doubt you will be disappointed. If you are looking for more I would consider saving your money for the release of a Steven Wilson re-mix of the original album later in the year. I was already sceptic by the idea somethime ago. Some recordings you just can´t equal or top.What it does is re-awaken the interest in the original work,wich is a good thing, but I hope this project will not inspire other to do the same, I am not waiting for a” Close to the Edge” part II to name one.